I’m finishing up book six of the bestselling Kissed by the Bay series, All About That Kiss. Quite a lot is happening to Janine in her story and not all of it good—yikes! You’ll see her same upbeat, quirky humor, though, as she navigates problems with her seemingly perfect stepsisters, the new career she’s dying to hold onto, and her attraction to her ex’s best friend, which clearly can’t go anywhere good. In order to celebrate the upcoming arrival of All About That Kiss, I want to post more about the Kissed by the Bay series over the next weeks. Today, here’s a bit about the breathtaking location of Blue Moon Bay. 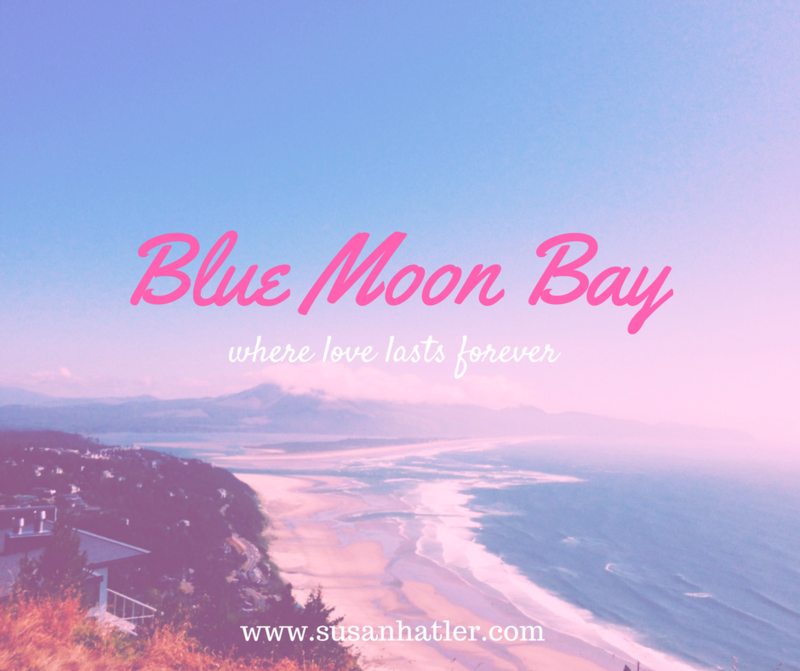 I grew up in the San Francisco bay area and have always loved spending time in the charming town of Half Moon Bay, which inspired me to create the fictional town of Blue Moon Bay for the Kissed by the Bay series. Blue Moon Bay has a semi-circular shape of land, located off the scenic, coastal Highway 1. Many houses are vacation homes and are only lived in during the summer. On the ocean side, most houses are two or three stories high with large porches, sweeping balconies, and views of the ocean or lighthouse. In the Spanish Colonial downtown, streets are fancifully paved in cobblestones, surrounded on either side by charming independent stores in bright cheery colors. Blue Moon Bay hosts a historic white lighthouse with black granite rocks strewn around the base. While enjoying their stay at the Inn at Blue Moon Bay, characters are sure to make their taste buds happy at the Over the Moon diner, Bay Side Coffee, Blue Moon Burgers, Frankie’s Fiesta, Scotty’s Seafood Restaurant, Huntington’s Seafood Grill, Uncle Shuang’s Chinese Restaurant, Margeaux’s restaurant, and The Market. If characters visit Blue Moon Bay in the fall, they can enjoy the annual Pumpkin Festival. After a day of walking around the Pumpkin Festival, they’ll want to treat their tired feet to a pedicure at the Blue Moon Day Spa. Since everyone loves books, it’s a must to visit the Blue Moon Bay Library to pick up some lovely sweet romance reads. I hope you’re enjoying the Kissed by the Bay series as much as I’m enjoying writing it. Happy reading! !